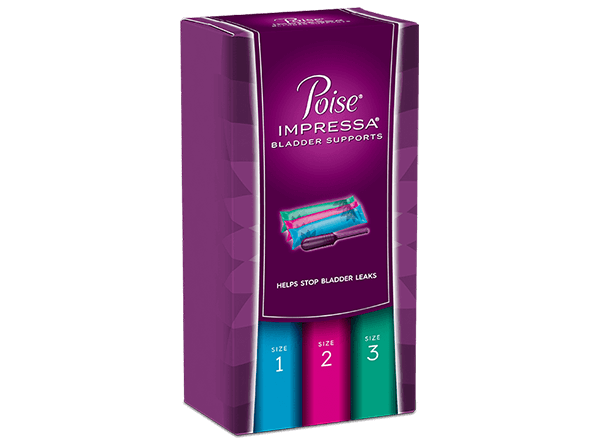 If you're still experiencing bladder leaks (Stress Urinary Incontinence) three months after delivery, you can try Poise® Impressa® Bladder Supports to help prevent leaks. Up to 30% of new mothers report Stress Urinary Incontinence (SUI) three months after delivery. Although pelvic floor muscles can be strengthened with exercises to reduce bladder leaks, deliveries can still have a large impact on the pelvic floor. These symptoms should be discussed with a health care provider who will make sure your bladder leakage is reassessed a few months after you start using Impressa®. You do not need a prescription for Poise® Impressa® Bladder Supports, but your healthcare provider can answer any questions about whether or not Impressa® is right for you. If you do decide to manage your SUI with Impressa®, be sure to start with the Sizing Kit to find your most effective and comfortable internal fit.